For the Canadian band, see Bush (Canadian band). Bush performing in Texas, 2011. L-R: Chris Traynor, Gavin Rossdale, and Corey Britz. 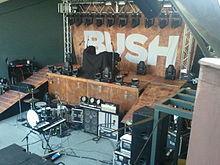 Bush are an English rock band formed in London, England in 1992. Their current lineup consists of lead vocalist and rhythm guitarist Gavin Rossdale, drummer Robin Goodridge, lead guitarist Chris Traynor, and bassist Corey Britz. In 1994, Bush found immediate success with the release of their debut album, Sixteen Stone, which is certified 6× multi-platinum by the RIAA. They went on to become one of the most commercially successful rock bands of the 1990s, selling over 10 million records in the United States and 20 million in the world. Despite their success in the United States, the band were less well known in their home country and enjoyed only marginal success there. Bush have had numerous top ten singles on the Billboard rock charts and one No. 1 album with Razorblade Suitcase in 1996. The band broke up in 2002 but reformed in 2010, and have released three albums since then: The Sea of Memories (2011), Man on the Run (2014), and Black and White Rainbows (2017). After leaving his band Midnight, Gavin Rossdale met former King Blank guitarist Nigel Pulsford in 1992. The two bonded over an appreciation of the American alternative rock group the Pixies. The two formed a new band which they called Future Primitive. Describing the early sound of the group, one British record label executive said years later, "They weren't what they are today – they were a little like the more commercial side of INXS". The pair then recruited bassist Dave Parsons and drummer Robin Goodridge to complete the line-up. The group soon chose the name "Bush", naming themselves after Shepherd's Bush, London, where the band members used to live. In 1993, the band was signed by Rob Kahane, who had a distribution deal with Disney's Hollywood Records. The band completed recording its debut album Sixteen Stone in early 1994. However, the death of Disney executive Frank G. Wells eliminated a supporter for Kahane, and executives at Hollywood deemed Bush's album unacceptable for release. As a result, the members of Bush took jobs performing menial labour. Interscope Records ultimately decided to release the album, and at the end of 1994, Kahane sent an advance copy of the album to a friend at influential Los Angeles radio station KROQ-FM, which added the song "Everything Zen" to its rotation. On the Billboard Music Charts (North America), Sixteen Stone peaked at No. 4 on the Heatseekers and Billboard 200 charts. The album spawned two Top 40 singles. After about six months of promotion for Sixteen Stone, the album began to sell well, once "Comedown" and "Glycerine" struck America. Additionally, "Little Things" and "Machinehead" both charted well in North America. In Canada, the band were initially forced to release Sixteen Stone under the name BushX, as the 1970s Canadian band Bush still held the rights to that name in the Canadian market. The dispute arose after the British band's lawyers threatened to intervene to prevent the Canadian band from reissuing its 1970 album, although it was entirely between the bands' lawyers as Rossdale and Domenic Troiano, the leader of the Canadian band, both expressed a willingness to negotiate a solution. 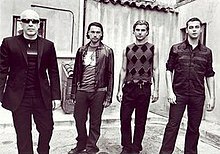 In 1997, after the band's second album Razorblade Suitcase also bore the X, Rossdale and Troiano directly negotiated an agreement under which the British band were allowed to drop the X in exchange for donating $20,000 each to the Starlight Foundation and the Canadian Music Therapy Trust Fund. Both Sixteen Stone and Razorblade Suitcase were then reissued without the X. In late 1996 Bush released the first single "Swallowed" from their second album titled Razorblade Suitcase. The song spent seven weeks on top of the Modern Rock Tracks chart. This was followed by single "Greedy Fly". The album hit number 1 in America and placed high in many European countries. Razorblade Suitcase featured American recording engineer Steve Albini, a move which was viewed negatively by critics. Albini had worked with Nirvana on their final studio album, In Utero, three years before. Bush later released the remix album Deconstructed. The album saw Bush re-arranging their songs into dance and techno stylings. The album went platinum less than a year after release. Following the completion of touring, Rossdale went into seclusion in Ireland, where he worked on material for the group's next album. Rossdale periodically sent demo tapes of his works in progress to his bandmates. The group finally convened to record in London in August 1998, where the band reteamed with Sixteen Stone producers Clive Langer and Alan Winstanley. The release of The Science of Things was held up by a court battle between the band and Trauma Records. The case was settled in early 1999 and the album was finally released that October. The Science of Things was a major departure in several forms from Bush's first two albums. Like the multi-platinum successes of Bush's first two albums, this album also reached platinum status. Also, while the band's previous albums were strongly influenced by grunge, The Science of Things featured some electronic music influences in addition to the sound defined by Bush's earlier work. For example, although lead single "The Chemicals Between Us" had a prominent guitar riff, it also had many electronic elements usually found in dance music. Although the album had a few hit songs, it failed to chart in the top 10. The band's performance at Woodstock '99, however, helped The Science of Things achieve platinum status despite its slow start. Three singles were released from The Science of Things, most notably "The Chemicals Between Us", which spent five weeks at No. 1 on the Modern Rock Tracks and peaked at No. 67 on the US Hot 100. "Warm Machine" was the second single released. "Letting the Cables Sleep," the third single, reached No. 4 on the Modern Rock Tracks and also received considerable airplay. In October 2001, now on the Atlantic Records record label, Bush released its next album, Golden State. While the album attempted to return to the simple, catchy sound of the band's debut, it failed to achieve the same commercial success as the band's previous releases. Several singles were released, most notably the hit "The People That We Love (Speed Kills)", but none were mainstream successes. The album was the band's least successful, selling only 380,000 copies in the US. "The People That We Love (Speed Kills)" was used in the game Need For Speed: Hot Pursuit 2. In January 2002, Pulsford retired after the release of Golden State to spend more time with his family. Chris Traynor filled in for him for the subsequent tour, which would turn out to be Bush's last for eight years. Due to declining record sales and a lack of support from Atlantic Records, Bush disbanded in 2002. In 2005, a greatest hits album called The Best of: 1994-1999 and a live album called Zen X Four were released. Current guitarist Chris Traynor performing with Bush in 2016. Gavin Rossdale formed a new band, Institute, in 2004, serving as their lead vocalist and guitarist, just as in Bush. Chris Traynor also joined the band, as lead guitarist. In addition to playing in Institute, Traynor also joined the reunited metal band Helmet in 2004 on bass; he quit the band in 2006. Institute released one album, Distort Yourself, but failed to achieve much commercial success in spite of opening for U2's Vertigo Tour at some shows. Institute broke up in 2006 and Rossdale then embarked on a solo career. In 2007, he covered the John Lennon song "Mind Games" for the Lennon tribute album Instant Karma: The Amnesty International Campaign to Save Darfur. His first solo album, Wanderlust, supported by leading single "Love Remains the Same", was released in June 2008. Rossdale also ventured into acting, appearing in the films Zoolander, Little Black Book, The Game of Their Lives, Constantine, How to Rob a Bank and others. Robin Goodridge recorded with the British rock band Elyss in 2004, although they have not released any new material since. In 2006, Goodridge began drumming for indie rock band Spear of Destiny, and appeared on their 2007 album, Imperial Prototype. 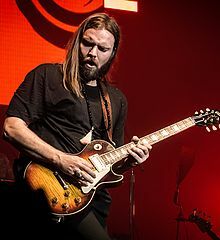 During the summer of 2008, he toured the UK with British rock band Stone Gods after their current drummer Ed Graham reportedly fell ill. On 29 July it was announced that Graham had left the band and on 6 October 2008, the band's website announced that Goodridge had joined the band. Nigel Pulsford has spent most of his time since leaving Bush raising his children with his wife. In an interview with Blender, Gavin Rossdale admitted that the likelihood of a Bush reunion was "very high". He then added "quite high," In a November 2008 interview, Rossdale revealed that he had tried to contact the other members of Bush, "I reached out to them." Pulsford's and Parsons' successors were Chris Traynor and Corey Britz respectively. Traynor had also stood in for Pulsford during the Golden State tour. The new line-up played seven shows in 2010, performing songs from Bush's previous four albums as well as a new song, "Afterlife". Gavin announced on radio that their new album had been named The Sea of Memories and was released in September and managed to peak at No. 18 on the Billboard Top 200. The first single of the album, "The Sound of Winter" was released in July 2011 and reached number one on the Billboard Alternative Songs chart. On 19 November 2011, Bush performed a live set for "Guitar Center Sessions" on DirecTV. The episode included an interview with program host, Nic Harcourt. Their song "Into The Blue" was featured on The Avengers soundtrack album released on 1 May 2012. They toured with Nickelback on their Here and Now Tour. On 26 March 2014, it was reported that Bush had begun recording their sixth studio album with producer Nick Raskulinecz. Gavin Rossdale announced on 18 August 2014 that the new album, Man on the Run, was available for pre-order in both digital and deluxe edition CD form. A day later, the band revealed that the lead single from the album would be "The Only Way Out". In November 2014, the band announced tour dates for the early months of 2015 beginning January 30  In June 2016, Bush released a music video for the new song "People At War". In January 2017, it was reported that Bush had mastered and completed work on their seventh studio album. On 6 February 2017, the band announced the title, release date of 10 March 2017, and track listing for their seventh studio album, Black and White Rainbows. The lead single from the album, "Mad Love", was released the same day. On April 2, 2018, a tour of the United States of America called Revolution 3 Tour was announced for the summer. They will perform as headlining with Stone Temple Pilots and The Cult. Rossdale also revealed that he was working on some material called "heavier" than the recent productions in anticipation of a forthcoming band album. "The twelve songs on Sixteen Stone sound exactly like what grunge is supposed to sound like, while the whole point of grunge was that it didn't really sound like anything, including itself. Just consider how many different bands and styles of music have been shoved under the "grunge" header in this discography alone, and you realize that grunge is probably the most ill-defined genre of music in history." ^ "Bush – Chart history – Billboard". Billboard. Retrieved 15 March 2017. ^ a b "BUSH To Release 'Black And White Rainbows' Album In March". blabbermouth.net. 6 February 2017. Retrieved 6 February 2017. ^ a b Daly, Steven. "Nirvanawannabes". Rolling Stone. 18 April 1996. Retrieved on 14 July 2009. ^ "The battle for Bush: Canadian band duking it out with Brits over its name". Halifax Daily News, June 12, 1997. ^ a b "X-cellent solution found to band's name woes". Waterloo Region Record, April 16, 1997. ^ "X marks the sore spot for mega-popular BushX". Hamilton Spectator, January 10, 1997. ^ "Both `X' and grunge gone from British Bush". Ottawa Citizen, May 22, 1997. ^ Uhelzski, Jaan. "Beating Around the Bush". Rolling Stone. 17 November 1998. Retrieved on 14 July 2009. ^ Eliscu, Jenny. "Bush's Wait Problem". Rolling Stone. 6 August 1999. Retrieved on 14 July 2009. ^ "Blogs". Rolling Stone. Retrieved 19 July 2011. ^ "Gavin Rossdale: Interview | Spin Magazine". Bush-music.com. 29 July 2010. Archived from the original on 8 July 2011. Retrieved 19 July 2011. ^ "Bush". Facebook. Retrieved 19 July 2011. ^ "Bush Back Atop Alternative Songs With Self-Released 'The Sound of Winter'". Billboard. Retrieved 25 April 2014. ^ Guitar Center Sessions with host Nic Harcourt Retrieved 10 October 2013. ^ "Bush Recording New Album With Producer Nick Raskulinecz". Blabbermouth.net. 26 March 2014. Retrieved 26 March 2014. ^ "Bush: The New Album". pledgemusic.com. 18 August 2014. Retrieved 18 August 2014. ^ "Excited to Announce Album and Single Date". twitter.com. 19 August 2014. Retrieved 19 August 2014. ^ "Bush: The Tour Dates". axs.com. 18 November 2014. Retrieved 18 November 2014. ^ "BUSH Honors World Refugee Day With 'People At War' Video". blabbermouth.net. 20 June 2016. Retrieved 22 June 2016. ^ "BUSH Completes Work On New Album". blabbermouth.net. 23 January 2017. Retrieved 24 January 2017. ^ "Bush, Stone Temple Pilots, the Cult Set Tri-Headlining 'Revolution 3' Tour". ^ "Bush's Gavin Rossdale Teases New Album". Loudwire. ^ Goodman, William (29 July 2010). "Q&A: Gavin Rossdale to Reunite Bush". Spin. ^ Steininger, Adam (23 August 2013). "The 10 Worst Post-Grunge Bands". LA Weekly. Retrieved 1 July 2015. ^ Brackett & Hoard 2004, p. 122. ^ "Sixteen Stone by Bush on MSN Music". Music.msn.com. Retrieved 18 June 2010. ^ Hyden, Steven (14 December 2010). "Part 6: 1995: Live, Bush, and Alanis Morissette take the pop path". The A.V. Club. Retrieved 1 July 2015. ^ Erlewine, Stephen Thomas. "Bush – The Science of Things". Allmusic. Retrieved 1 July 2015. ^ Grierson, Tim. "The History of Post-Grunge Rock". About.com. ^ Diehl, Matt (13 November 1996). "Bush: Razorblade Suitcase". Rolling Stone. Archived from the original on 16 February 2007. ^ Klosterman 2007, p. 240. ^ Anderson 2007, p. 207. Anderson, Kyle (2007). Accidental Revolution: The Story of Grunge. Macmillan. ISBN 9780312358198. Klosterman, Chuck (2007). Fargo Rock City: A Heavy Metal Odyssey in Rural North Dakota. Simon and Schuster. ISBN 9781416589525. Brackett, Nathan; Hoard, Christian David (2004). The New Rolling Stone Album Guide. Rolling Stone. Simon and Schuster. ISBN 9780743201698. Wikimedia Commons has media related to Category:Bush (musical group).